Yeovil Town boss Gary Johnson has said his side are not worried about their eight-match winning run ending. The Glovers are fifth in League One following Saturday's 3-0 win against Scunthorpe United. "The lads just don't worry about losing," Johnson told BBC Somerset. "They know a defeat really isn't the end of the world. "That helps keep a run going because there's no nerves. They're going out and playing bold, attacking football." Yeovil have picked up all 24 points on offer since losing to Bournemouth on 26 December - a new club record in the Football League. Johnson's side face fellow high-flyers Doncaster Rovers at the Keepmoat Stadium on Saturday. Rovers are a point and two places above the Glovers but have won just once in five games since Brian Flynn was appointed permanent manager after Dean Saunders left to join Wolves. "Obviously it's good for us that things aren't going so well elsewhere but we just have to look at the next game, and this one's very, very important," Johnson continued. "Dean [Saunders] left and now Donny aren't pulling up any trees. But we can't forget Doncaster are up there because they're one of the best teams in the league; we have to respect them." 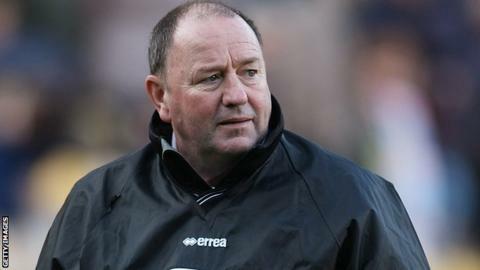 Johnson returned to Huish Park just over a year ago and after a period of consolidation, Yeovil are mounting their first serious promotion push since losing in the League One play-off final to Blackpool in 2007. "They're a good group of lads that trust each other, trust us, and go into every match thinking they can win," the former Bristol City and Peterborough boss added. "We've found a system and philosophy that fits and now we need to be strong in the business end of the season when it really matters."